You work as a project manager for company.com Inc.
You need to develop a solution so that the project manager, executives, and team members can review and discuss the risks of the company’s project online. A. Create a new workspace called Risk, and assign permissions to the project manager, executives, and team members. C. Create a new workspace, and assign the appropriate permissions to the project manager, executives, and team members. D. Use the existing Risk link in the project workspace that is already created using Microsoft Project Server. The executives, project managers, and project team members can use default project workspace to discuss the risks within the project. The default project workspace contains a link called “Risks” that is used to share information regarding project risks to minimize their potential effect on the project and provide ongoing management of identified risks. Answer option A is incorrect. There is no reason to create an additional workspace, as there is a default workspace for all projects with a link called “Risks”. Answer option C is incorrect. The Risk workspace already exists for the project. Answer option B is incorrect. A Web Part is a link to a resource. It is not needed for this scenario. What is a project workspace? A Project Workspace is a Microsoft SharePoint Teamsite where the Project team can share documents, issues and risks. A project workspace is created for each project schedule. It is used to leverage WSS technology to enhance communication between project team members. Project managers might use the project workspace to list announcements and events, store a project’s documentation, and navigate to the Issues, Risks, and Documents pages for the project. What are the different methods for creating a project workspace? 1.Automatically: A new workspace is created automatically during a publish operation of an activity plan or proposal in PWA. 2.Semi-Automatically: The project owner is given the option to link the project workspace to an existing project workspace during a publish operation of an enterprise project schedule. This is commonly used for master/child project relationships. The project owners can also update the URL of the new project workspace. 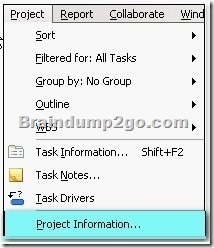 3.Manually: The project owner can manually create project workspaces in Project Server. This option allows a project owner to choose whether to create a workspace at the time of a publish operation of an activity plan or proposal in PWA. Gary is the Microsoft Project Server administrator for his company, and is configuring a restore method for his SQL Server. Gary would like to use a command to ensure that the backup operation verifies each page for checksum and torn page and for the entire backup. What command should Gary use? The CHECKSUM command requests that the backup operation verify each page for checksum and torn page. Answer option B is incorrect. The NO_CHECKSUM is the default selection for the restore, and does not verify each page during the restore process. Answer option D is incorrect. CONTINUE_AFTER_ERROR is used in conjunction with the CHECKSUM command. When an error occurs, this command allows the restore to continue but logs the error. Answer option A is incorrect. STOP_ON_ERROR is used in conjunction with the CHECKSUM command. When an error occurs, this command stops the restore process. You have been assigned the task to manage a project in order to streamline business processes. You need to prepare a resource estimate required to complete the project in six months or less. The executives want to know how many resources you will need and the skill sets each resource must possess. You have constructed a task list and linked the tasks to create a schedule. What should you do next to prepare the estimate? A. You should open the Assign Resources dialog box. For each task in the project, search for resources by Resource Breakdown Structure codes and assign them to tasks. B. You should create generic resources for each set of skills the project requires and assign generic resources to all the tasks. C. You should assign specific resources to your project tasks. Then, generate a resource report that specifies the number of resources you need based on their Resource Breakdown Structure codes. D. For all the resources you create in your Project file, in the Booking Type drop-down list, choose Proposed. You will create generic resources for each set of skills the project requires, as shown below, and then assign generic resources to all the tasks. Generic resources represent skill sets rather than specific people. By assigning generic resources to tasks, a user can estimate how many resources he needs of each skill set for each time period of a project. Later, generic resources can be replaced with specific resources. Answer option C is incorrect. Assigning specific resources to tasks is not the best way to estimate resources based on skill sets. The skill sets required are not immediately obvious based on a resource name and you must be sure to replace the specific resources you originally assigned with the resources you have been given for your project. Answer option A is incorrect. The Resource Breakdown Structure codes do represent skill sets. However, assigning specific resources means that you must be careful to replace those temporary resources with the ones you have been given for your project. Answer option D is incorrect. Using the Proposed booking type designates resources as tentative assignments when you publish a project to a Project Server. Booking type does not help you determine how many resources you need based on skill sets and does not apply when you use Microsoft Project without Project Server. Resources are required to carry out the project tasks. They can be people, equipment, facilities, funding, or anything else capable of definition (usually other than labour) required for the completion of a project activity. The lack of a resource will therefore be a constraint on the completion of the project activity. There are three types of resources in Project 2007: work, material, and cost. Work resources are those, which are not consumed on the completion of the assigned task. The most common example of work resource is people. Material resources are those, which are consumed as a task progresses. The examples are ink, concrete, wood, etc. Cost resources represent additional costs that are incurred on a task, such as travel expenses, etc. You along with your team need to level project resources. One of your team members is concerned about which project he should work on first. Which of the following attributes of the projects will determine which project your team should work on first when resource leveling is done? The project priority is set within the Project Information dialog box and is valued from 1 to 1000 with 500 being the default. When a resource is used on multiple projects and resource leveling is used, the project with the highest priority will use the resource’s time first. Answer option C is incorrect. The project manager may have some influence, but the software will schedule the project manager to work based on the project priority. Answer option A is incorrect. Critical path activities are important, but it is not the determining factor, as the project manager could have critical path activities in all projects. Answer option B is incorrect. The nearest milestone is not the deciding factor of project priority. How to enter project information? 1.Select Project > Project Information. 2.Enter the information in the Project Information dialog box, and click the OK button. Note: The Project Information dialog box is used to enter, review, or change initial information for a new project. 1. Start Date: It is used to specify the start date of the current project. This option is only available if Project Start Date is chosen from the Schedule from drop-down box. Microsoft Office Project calculates the finish date of the project based on the entered start date and assigns the default constraint of As Soon As Possible (ASAP). By default, the project start date is the current date. 2.Finish Date: It is used to specify the finish date of the current project. This option is only available if Project Finish Date is chosen from the Schedule from drop-down box. Project calculates the start date of the project based on the entered finish date and assigns the default constraint of As Late As Possible (ALAP). 3. Current date: It specifies the current date. By default, this date is generated by the computer’s date and time. 4. Status date: It is used to specify the status date. The status date is used to perform earned value calculations, identify the complete-through date in the Update Project dialog box, and place progress lines. If the status date is set to NA, the current date is used as the status date. 5. Schedule from: It is used to specify whether the project is scheduled from a Project Start Date or a Project Finish Date. By default, projects are scheduled from the start date. 6. Calendar: It is used to specify the base calendar to be used for the project calendar. 7. Priority: It is used to indicate how readily tasks in the current project are delayed when resources are leveled across multiple projects. A number between 0 and 1000 can be typed or selected. A higher number indicates a higher priority project. 8. Statistics button: It is used to open the Project Statistics dialog box for the current project. The Project Statistics dialog box is used to review scheduled and actual start and finish dates, durations, work, and costs. There are three primary baselines in a project. Which one of the following is NOT a baseline that can be captured in Microsoft Project Server? Quality is not a project management baseline. Scope often serves as the quality baseline as it represents all that the project should deliver. Answer option B is incorrect. Cost is one of the three baselines and it can be kept and measured in Microsoft Project Server. Answer option D is incorrect. Scope is a constant baseline; it consists of the project scope statement, work breakdown structure, and the WBS dictionary. Answer option A is incorrect. You can create and maintain a schedule baseline in Microsoft Project Server. The executive team has asked you to estimate the labor costs for your project. How will you estimate the labor costs without assigning specific people to the tasks? B. You should create work resources that will act as placeholders, set their cost rates to an average amount for the corresponding skill set, and assign the work resources to tasks. Generic resources designate the skills required for a task, instead of a specific resource. You can estimate labor costs and the project schedule using generic resources, and then later replace the generic resources with actual resources. Generic resources represent skill sets rather than specific people. By assigning generic resources to tasks, a user can estimate how many resources he needs of each skill set for each time period of a project. Later, generic resources can be replaced with specific resources. Answer option B is incorrect. Although you can create additional work resources to act as placeholders, generic resources are preferable, because it is easier to differentiate tasks assigned to real and generic resources. Answer option A is incorrect. In Project 2010, budget resources correspond to budget line items that you need to track, such as labor, travel, and so on. You assign budgeted values to the budget resources. Answer option D is incorrect. Cost resources are used to add cost to tasks, but are not related to your project schedule, such as training or travel. You work as the Project Administrator for company.com Inc.
You have configured some custom changes to a user’s site permissions. Later, you use the Synchronize command in the Project Workspaces. What will happen to the user’s site permissions that you have customized after you synchronize the site? A. Any modified changes to the user’s site permissions will be added to the user’s site permissions unless the custom changes you have created for the user are more restrictive. B. Any custom changes to a user’s site permissions will be lost. C. Any modified changes will be added to the user’s site permission if they are more restrictive. D. The changes will remain in the site. When an administrator uses the synchronize option, users are added to the appropriate site security groups based on the permissions and role in the project schedule. Any custom changes to a user’s site permissions will be lost. Modified site group permissions will not be lost during synchronization. Answer option D is incorrect. The changes will be replaced by the site security groups. Answer options C and A are incorrect. The synchronization command does not consider the elevation of restrictive nature of the user permissions. You work as a Project Administrator for company.com Inc. One of your team members, Ralph, reports that he is trying to customize, through his Microsoft Project Professional, the Gantt Chart view but he receives an error when he tries to rename the view. What is the most likely problem in this scenario? Ralph cannot rename the Gantt Chart, because no one can rename or delete an Enterprise Global default view. The most common default views are Gantt Chart, Detailed Gantt Chart, Calendar, and the Network Diagram. Answer option A is incorrect. This is not enough information to be considered correct. Answer option C is incorrect. This is not a valid reason for why Ralph cannot delete the Gantt Chart. Answer option B is incorrect. There is not a category of views called an EPM Global view, so this choice is wrong. A Gantt chart is a type of bar chart that illustrates a project schedule. Gantt charts illustrate the start and finish dates of the terminal elements and summary elements of a project. Terminal elements and summary elements comprise the work breakdown structure of the project. Some Gantt charts also show the dependency (i.e, precedence network) relationships between activities. Gantt charts have become a common technique for representing the phases and activities of a project work breakdown structure (WBS), so they can be understood by a wide audience. You work as a Project Administrator for company.com Inc.
You have been assigned a task to maintain the security of the Project Web Access and would like to create a security template for the server. Where can you create and apply a security template? A. In PWA, choose Server Settings, Security Templates, Manage Templates, and then choose New Template. B. In PWA, choose Server Settings, Site Settings, Security Templates, Manage Templates, and then choose New Template. C. In PWA, choose Site Settings, Security Templates, Manage Templates, and then choose New Template. You can create new templates through PWA by accessing Site Settings, Security Templates, Manage templates, and then choosing New Template. Answer options C, B, and D are incorrect. These are not the correct paths to create and apply a security template. What are the pre-connected reporting database templates in Project Server 2010? Project Server 2010 provides pre-connected blank templates for creating reports using the reporting database. These reporting templates focus on key entities within Project Server 2010. Thus, it becomes easier to create quick reports on specific items. You need to create a view that will allow a Resource Manager to see the summary information, tracking, and work data, but not cost information. Which part of the security controls what data a user can see? Categories are the key to control what data a user can see and manage. Answer option D is incorrect. Permissions control what a user can do with the system. Answer option B is incorrect. Groups are the collections of users, such as Executive, Project managers, and Team Members, who have common needs. Answer option C is incorrect. Local security is not really an accurate term, but it describes the security on a local system for the local interaction. Security controls are safeguards or countermeasures to avoid, counteract, or minimize security risks. Security control monitoring requires choosing the security controls to be monitored. FIPS 199 can support the selection of controls that are to be monitored. FIPS 199 helps in determining the security categories of the information and information systems and identifies the elements that are most critical to the organization. After the determination of security controls, the next function is to assess whether the controls are performing as required in the system security plan. This task is done by the information system owner. Security controls can be implemented through audits, self assessments, and other evaluation methods. NIST Special Publication 800-53A provides a standard approach for the assessment of security controls.